Master planning effort for 22 acres for the State of Colorado, DMVA, Existing Joint Force Headquarters (JFHQ) Centennial Campus (15 Acres), the Existing Camp George West (CGW) Golden Campus (7 Acres) and additional future sites of 7 and 60+ Acres for long-term sustainability. An evaluation through FUS (Facility Utilization Study), Manning Documentation (AR 405-70) and planning exercises to determine the needed growth attributes for a new JFHQ campus, or a Modified Existing JFHQ campus plus supporting facilities at Camp George West. 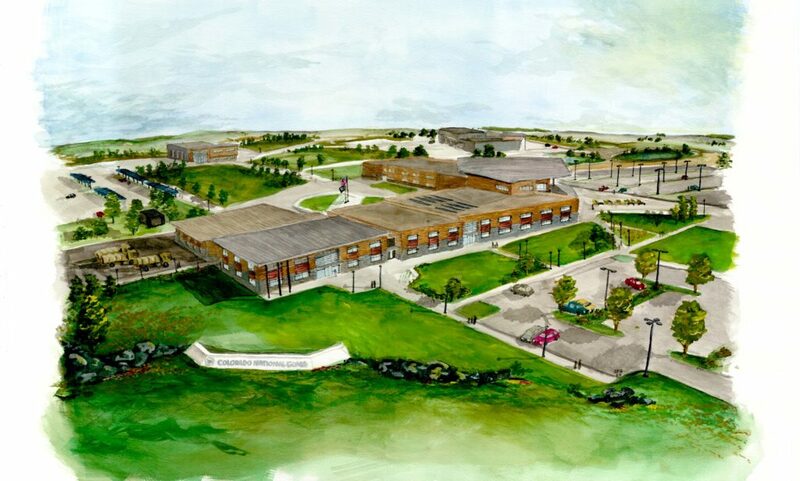 The masterplan included the team surveying 9 facilities (existing buildings and leased support space in 4 different locations) in addition to consideration of other existing Guard assets and sites on the Front Range that could bring positive change to the overall working business that has the capacity and flexibility for future expansion and change. The results of the Masterplans provided options for expanding existing sites, new siting for all components, and a hybrid option. A timeline of how parts and pieces could be executed while also considering high level cost for land acquisition, land development, building design and construction was provided in detail. In addition the D2C Architects team was tasked with detailing out provisions for renovating the 3 existing buildings on the existing JFHQ campus and 4 buildings at the Camp George West location to comply with today’s AT/FP and LEED/Sustainability requirements.